Simon & Schuster, 9781416598800, 305pp. The urgent truth about the privatization of America's national security that exposes where this industry came from, how it operates, where it's heading--and why we should be concerned. Thirty years ago there were no private military and security companies (PMSCs); there were only mercenaries. Now the PMSCs are a bona-fide industry, an indispensable part of American foreign and military policy. PMSCs assist US forces in combat operations and replace them after the military withdraws from combat zones; they guard our embassies; they play key roles in US counterterrorism strategies; and Homeland Security depends on them. Their services include maritime security, police training, drone operations, cyber security, and intelligence analysis (as Edward Snowden has famously revealed). Even the United Nations employs them. When did this happen? The turning point came when the US found itself in a prolonged war with Iraq, but without adequate forces. So the Bush Administration turned to the PMSCs to fill the gap. Private contractors and subcontractors eventually exceeded the traditional troops. The industry has never scaled back. Ann Hagedorn profiles the members of Congress who recognize the dangers of dependence on PMSCs, but have been unable to limit them or even determine their true scope. She takes us to the exclusive club in London where the PMSCs were created, and she reveals the key figure in the evolution of the industry. She introduces us to a US Army general who studies new developments, such as PMSCs' drone operations, and worries about PMSCs potentially fighting American troops. 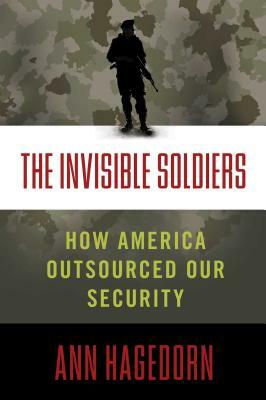 The Invisible Soldiers will inspire a national dialogue about a little-known international industry on which our security rests.